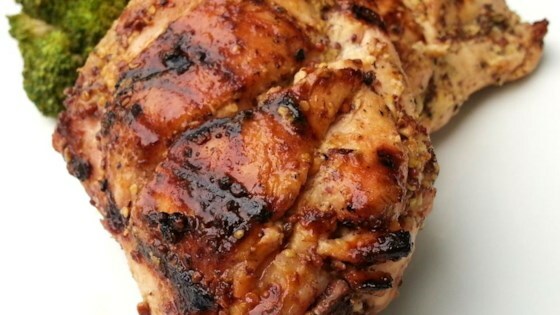 "When it comes to mustard, sweet-hot works amazingly well, especially as a glaze for chicken. Even though we are using skin-on bone-in chicken thighs, I'm sure it will work with any cut of chicken. By the time this is done, it doesn't have a super-strong mustard flavor. It gets mellowed out by the brown sugar and spices. The old saying 'The closer the bone, the sweeter the meat' really is true. Leaving in the bones adds a lot of flavor and juiciness." Consider all the spices 'to taste' and adjust to your liking. Absolutely delicious! My family loved this dish! Very easy to prepare too. My whole family really liked it! Very tasty, sweet and not too spicy! Thanks!